Today, we are comparing the latest RealMe U1 with the RealMe 2 Pro. The comparison is based on specifications and features. The RealMe U1 is the world’s first smartphone that features a MediaTek Helio P70 octa-core processor. 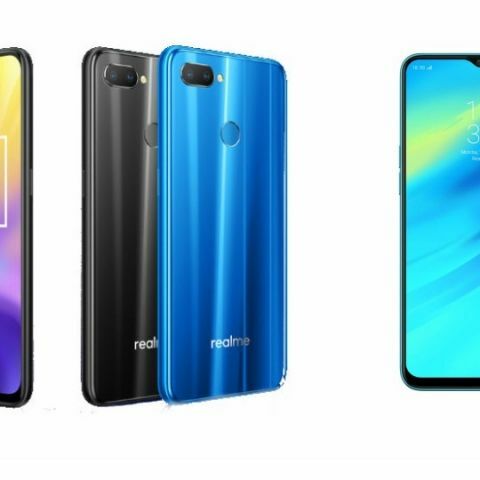 It is also the first smartphone in the RealMe U series. It has a 6.3-inch display with a teardrop notch. On the other hand, the RealMe 2 Pro, which was launched back in October at a price of Rs 13,990 with a dual camera set up at the back is a pretty impressive device due to the price at, which it comes. 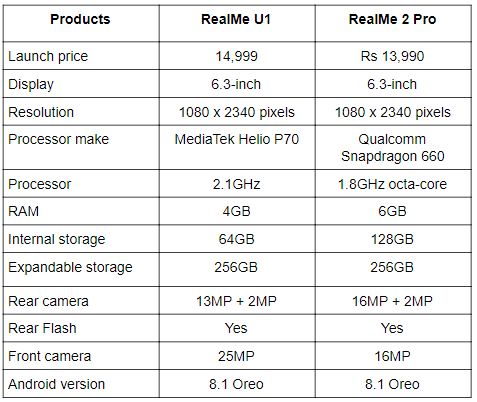 So, let begin with a quick specification comparison to see what’s new the company has bought with its latest RealMe U1. The Realme U1 sports a 6.3-inch display that offers a resolution of 1080 x 2340 pixels. On the other hand, the RealMe 2 Pro sports a 6.3-inch display that also offers a resolution of 1080 x 2340 pixels. Coming to the processor, the RealMe U1 is the world’s first smartphone that is powered by a MediaTek Helio P70 processor. On the other hand, the RealMe 2 Pro is backed by Qualcomm Snapdragon 660 processor. When it comes to the cameras, the RealMe U1 comes with a dual 13MP + 2MP rear camera with a 25MP sensor on the front. The RealMe 2 Pro also features a dual camera set up at the back as it comes with 16MP + 2MP rear camera along with a 16MP unit at the front. The RealMe U1 is finally introduced in India and is starting from Rs 11,999, while the RealMe 2 Pro is available in India at Rs 13,999 on Flipkart in India.